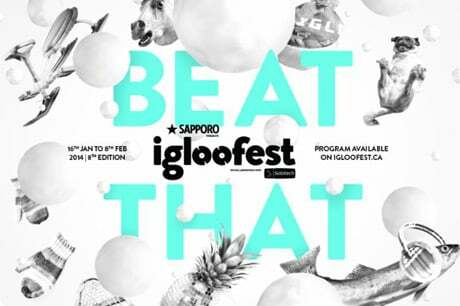 As we brace ourselves for an icy winter, the brave folks at Igloofest are gearing up for another instalment of their outdoor electronic music extravaganza in Montreal. The festival's eighth edition will run on the weekends between January 16 and February 8. More specifically, the fest takes place at the Jacques-Cartier Quay, Old Port of Montreal, on January 16 to 18, January 23 to 25, January 30 to February 1, and February 6 to 8. During those weekends, the fest has once again roped in a pile of noteworthy acts, including Skream, Matthew Dear, Sharam (formerly one-half of Deep Dish), Just Blaze, Totally Enormous Extinct Dinosaurs, Pete Tong, Âme, Stephan Bodzin, Scuba, Levon Vincent, Misstress Barbara, Christian Pronovost, Hot Since 82, Foreign Beggars, Breach, RL Grime, MiM0SA, Claude VonStroke, Justin Martin, Nôze, dOP, Sety, Adam Beyer, Ida Engberg and Mateo Murphy. You can get the specific details of who is playing when here on the festival website, where you can also find the full list of all the artists playing Igloofest. Some of the artists on the bill will appear on what organizers explain is an "entirely new and immersive second outdoor stage that's three times larger than the retired Igloo dome and drastically improves the dynamic of the site." Tickets go on sale on December 10. They will be sold at the Iglooboutique, an official box office that will open at 4523 Rue Saint-Denis in Montreal, as well as Ticketpro and various local shops. Full passes cost $95 before December 24 or $120 thereafter; weekend passes cost $40 for three nights; and single-day tickets cost $15 before January 10, $17 after that, or $20 at the door. Go here for more ticket details.